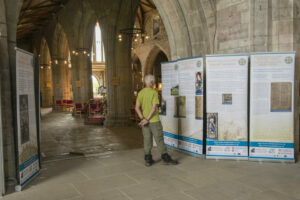 After a short break, during which our planned event in March in Lincoln was cancelled due to snow, the ‘Cult of Saints in Wales’ exhibition is on display once again at St Asaph Cathedral. The exhibition is on display from 30 July until 4 September, when members of the team will be visiting the cathedral to talk about the work of the project. A Latin Life of Asaph was included in the lost Red Book of Asaph, which is known from early modern transcripts, and a new edition of the Life is being prepared by David Callander. If you would like to come and meet members of the project team at St Asaph, we will assemble in the south transept at 2.00 on 4 September.